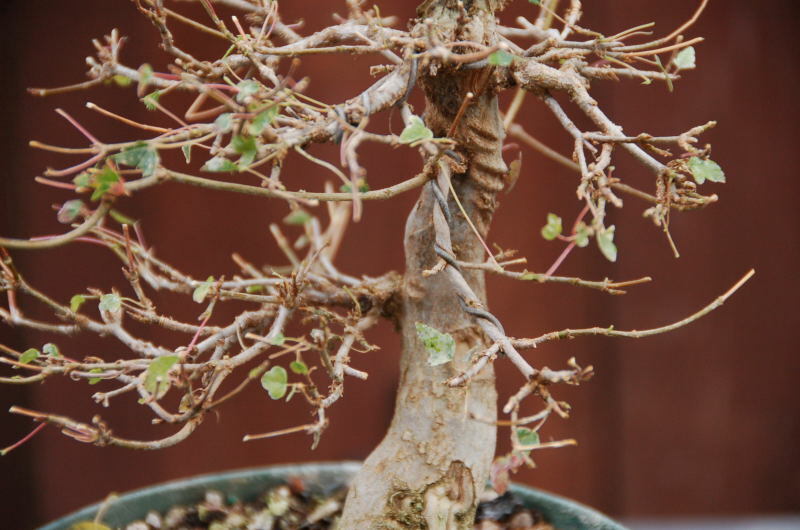 I think by now most people doing bonsai for a couple years can understand what a trunk chop does for helping improve the shape and movement in an otherwise boring trunk line. The need for additional chops in the future helps preserve the taper we seek. It may take as many as 5 or 6 trunk chops to induce the proper taper and keep it smooth looking. Too few chops and the trunk will build bulges and bumps that can otherwise ruin a pretty trunk. 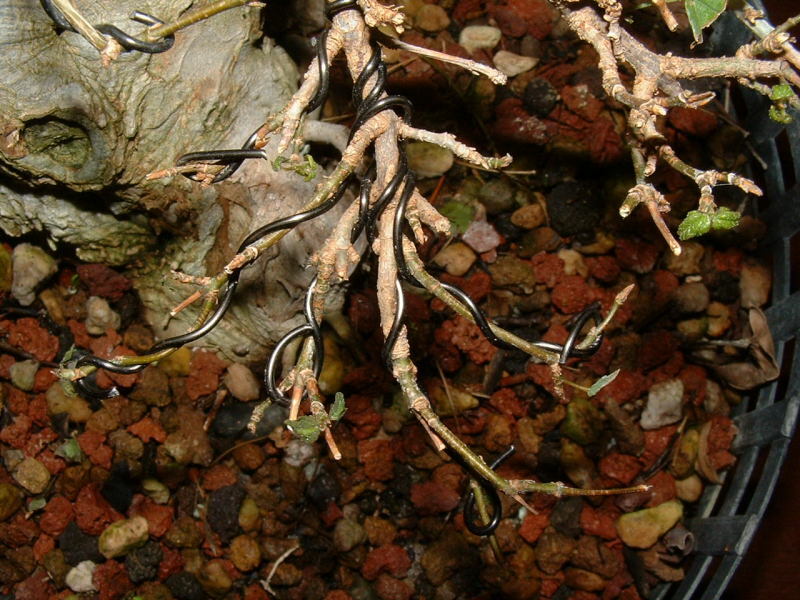 To build nice branches, the same thing must be done to them as in a trunk line only on a much smaller scale. 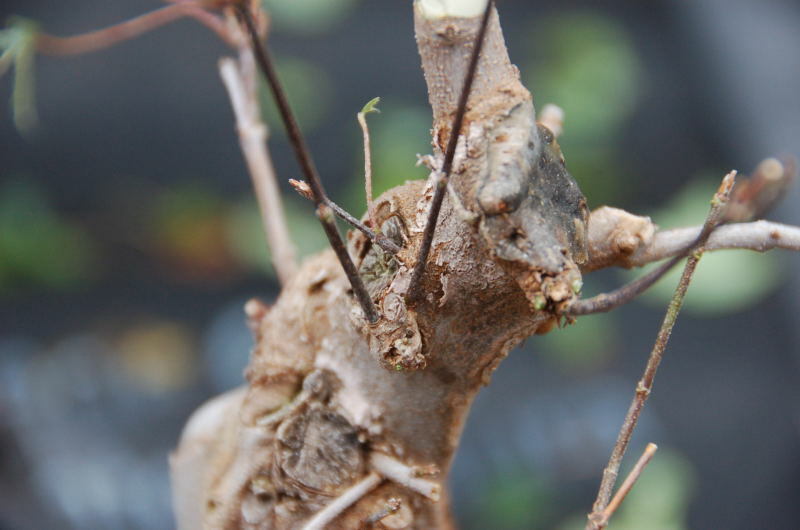 The branch will be tapered much the same way as the trunk and the only way to get that look and feel is to grow and prune back, grow and prune back. 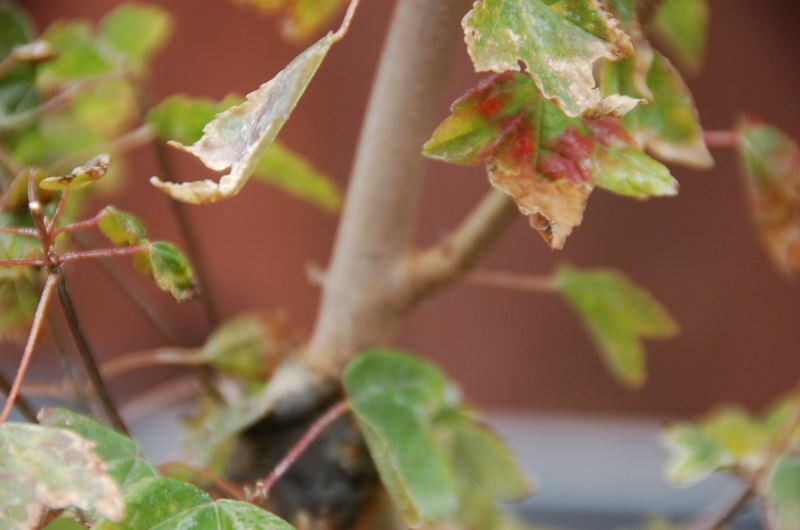 This pruning back is the hard part because it means cutting off all ones work each year. A maple tree cannot build a good branch in a few years without chopping. You could, but the branch will be as much a twelve inches long and about as big as no. 4 copper wire and have no taper. 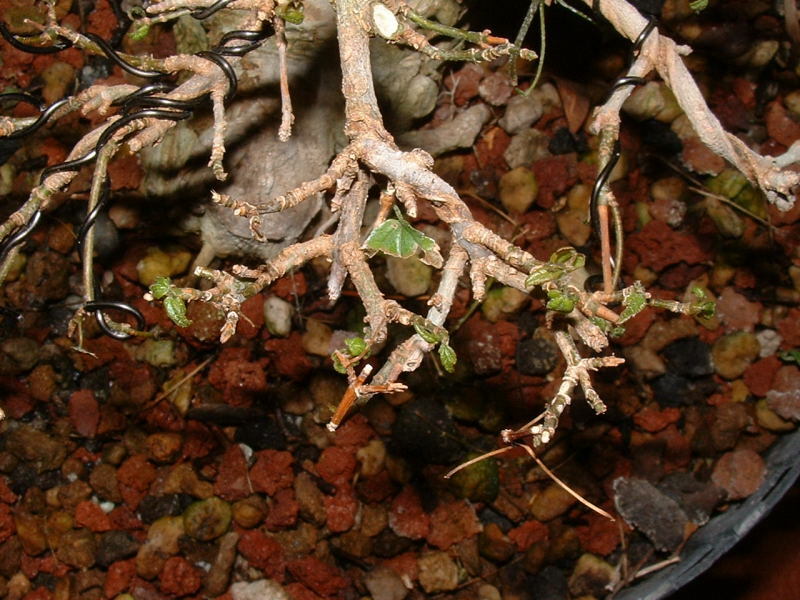 There are few key things to look for when building branches. Keep those internodes as short as possible. 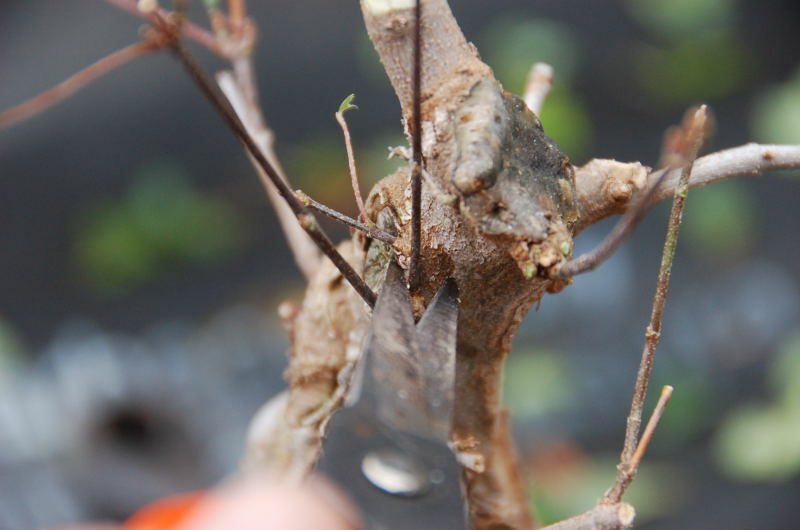 Everytime a twig is pruned make sure to cut back as soon as the leaves unfurl to keep the internode short for the next cutback. On a shohin tree if it grows longer than half an inch it is too long and you will need to start over. This care is only needed once the branch is as big as you want it. Much like building a trunk with chops it is not so necessary to build branches at that time. It is always important to make that first cut after bud break though and allow it to become rote. 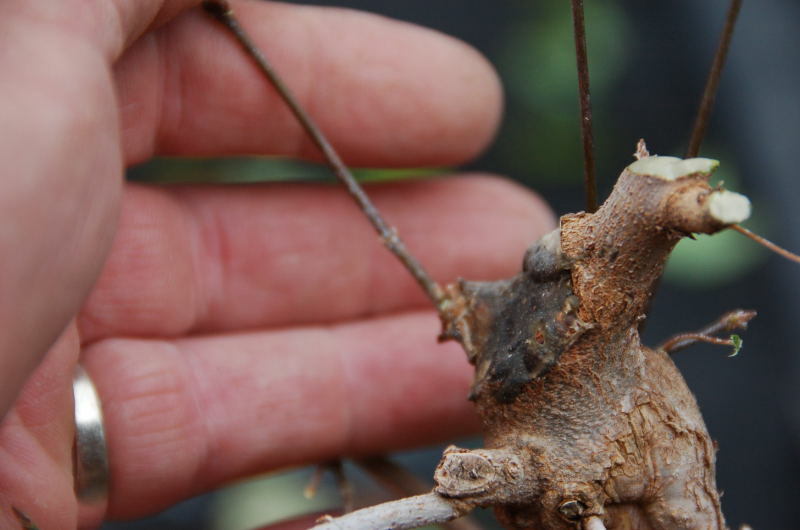 eventhough you may cut this stem back, it is important to have a node to cut back to. 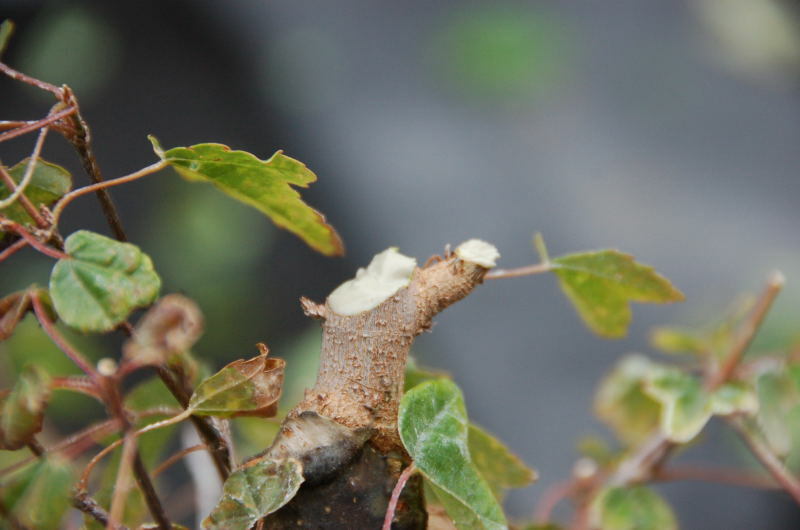 Pruning must be done religiously to get a good looking branch. I wish I had more time to devote to this task. Mostly I work on the trees on weekends and a weeks growth is too much to deal with in the middle of summer. 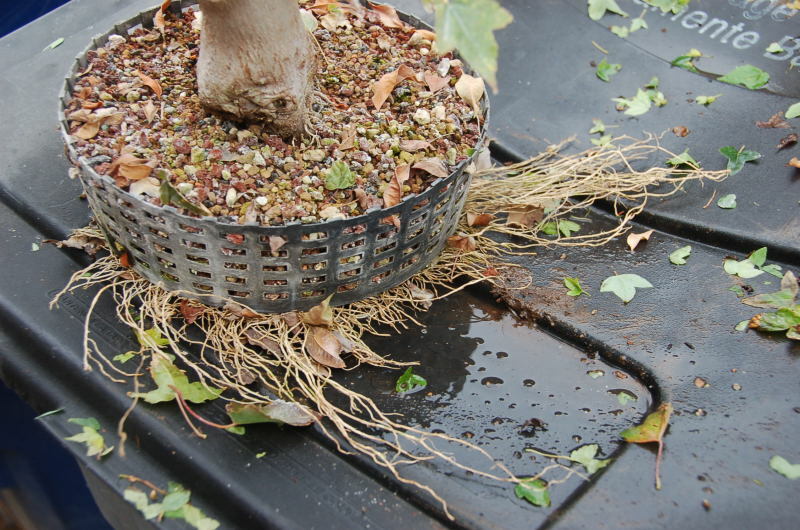 Fertilizer and water is important to get the tree to build leaf mass quickly. fertilizing is one of those things that is rewarded by vigilence. Prune it back each season till it is finished. At that point it will only last a few seasons and another branch will take its place. So branch building on shohin trees is continual. The pictures are decieving, because the internodes look fairly long in the pics, but it was shot with a macro lens and none of the nodes are over 1/4 inch apart. This tree is a prime example of ruining what looks like a good deal of ramification from this season. It is and it really hurt me to take it all off. The tree will be better and it will look the same next year, except that I will have a better base branch on which the ramification will grow. 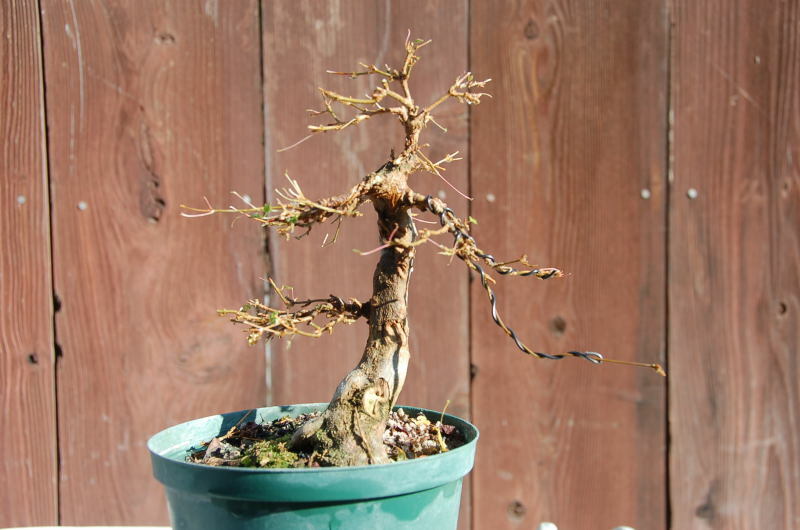 This is another Ed Clark trident from a couple years ago at the bonsai swapmeet. This tree was bought as a stump and I have been growing an apex and hopefully what will become some branches down the road. Mostly the tree was allowed to heal some chop scars and try to get a better taper up top. Who says a tree needs soil to grow in. This plant grows roots right on top of the bench looking for more water where ever it can find it. They even grow under other pots in search of water. Soil just provides spaces for vapor, its not really needed as long as the benches stay wet from misters, which these do. A couple of these views are blurry, sorry about that. They are clear enough to get the jist of whats going on. These are just some before shots of how I will deal with the apex. Just follow along. 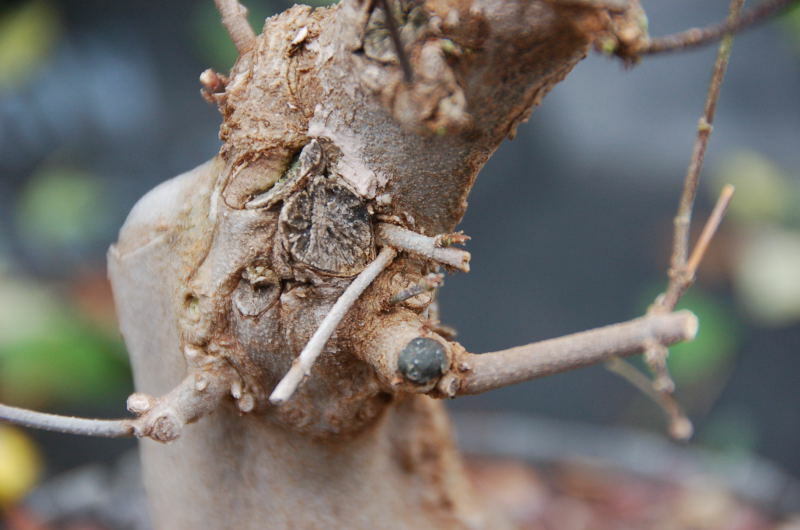 See the preserved bud to the left of the larger stub, while the new leader going to the right has been pruned back to a set of double buds. 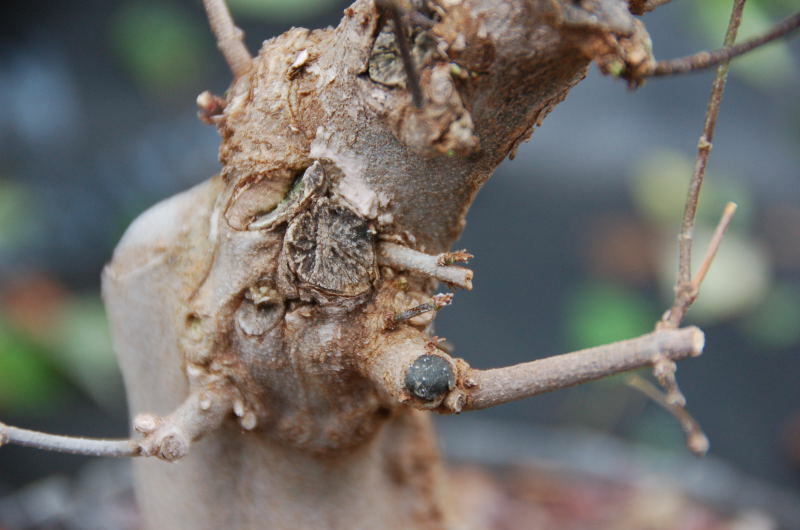 In colder enviroments pruning like this might freeze off these buds. I can seal the cuts and be OK here. Here we have a plce where three shoots all the same size have grown from one place. One will have to be chosen and the others cut off. Notice the cut paste on the trunk from last year. This apex has been chopped twice this year (at the same time) and once last year, for three chops in one year. Notice that the first buds are half the distince of the thickness of my finger. That is only about 3/8 inch. That is a good place for a bud, and the branch will be cut back to that bud in about April or so. See how close I kep the buds to the trunk? I do this maybe three times. This will allow me to prune back to reliable budding points later on down the doad compare that to the larger branch below and how far out from the trunk that first node is. Here is the tree all wired up and ready for another season of improvement. Now it can be seen the direction of the apex cuts. The apex should always move forward to greet the viewer. I refer to the pics in this section “Who says a tree needs soil to grow in. This plant grows roots right on top of the bench looking for more water where ever it can find it. 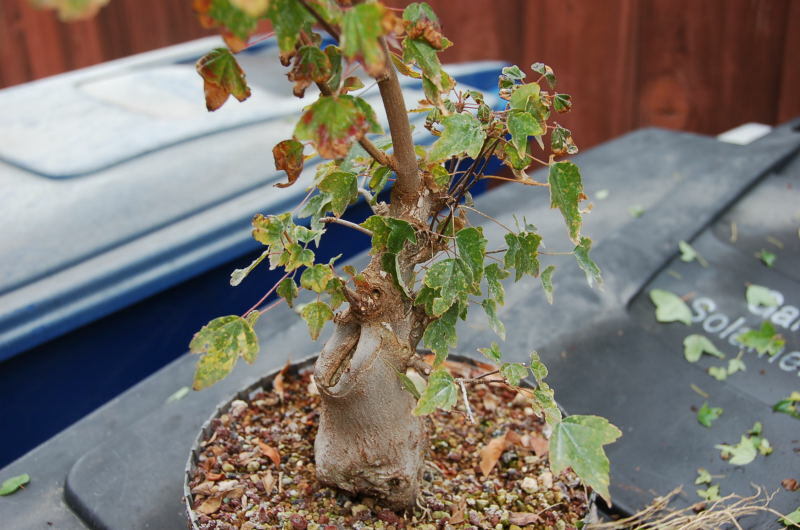 They even grow under other pots in search of water” I noticed a familiar condition or problem I also have with my Tridents every year and that is distorted leaves, burnt edges, mottled color. I have tried everything I know to arrest this condition and hoped you could shed some light on how you deal with it…. or not? Nice to meet someone else who shares an equal obsession with this very rewarding species….. Distorted leaves- I get distorted leaves only in the spring. Shaped like claws. This , for me, is due to over watering and watering the foliage too late in the day. When the sun drops the early temps drop to far and I get fungus due to the leaves staying wet. I am much more careful about watering in spring and never water the leaves anymore until the temps stay above 65 degrees at night. I pretty much don’t have that problem anymore. I also spray with a prepared fungicide that will take care of the problem, Except for the leaves already out. They must be picked off and wait for new ones. burnt edges- You will be the trident God if you can fix this problem. I still get them late in summer. Watering five times a day seems to get rid of the problem. I have done that and can keep the tree almost burnt edge free clear untill Oct. It’s not practical for me cause I have to use a water system to water while I’m at work and the leaves get all crappy looking with calcium. 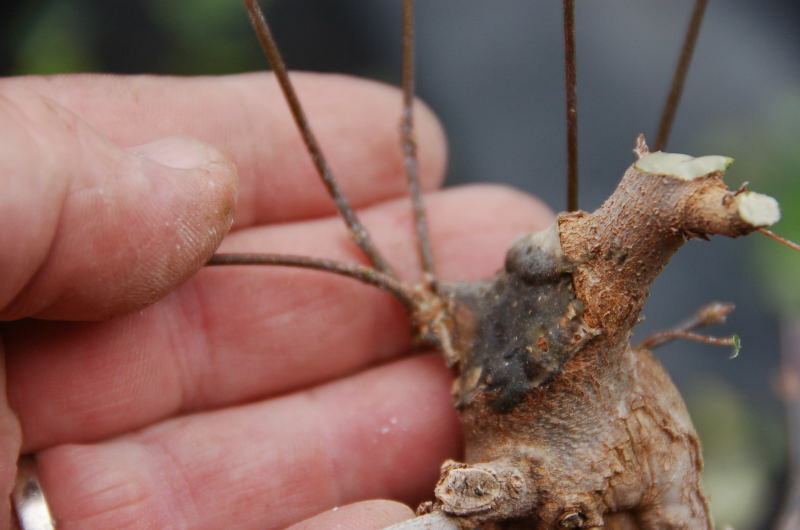 Additions of humus to the soil can help alliviate that problem. mottled color- In spring try one teaspoon epsom salt per gallon of water at monthly intervals. 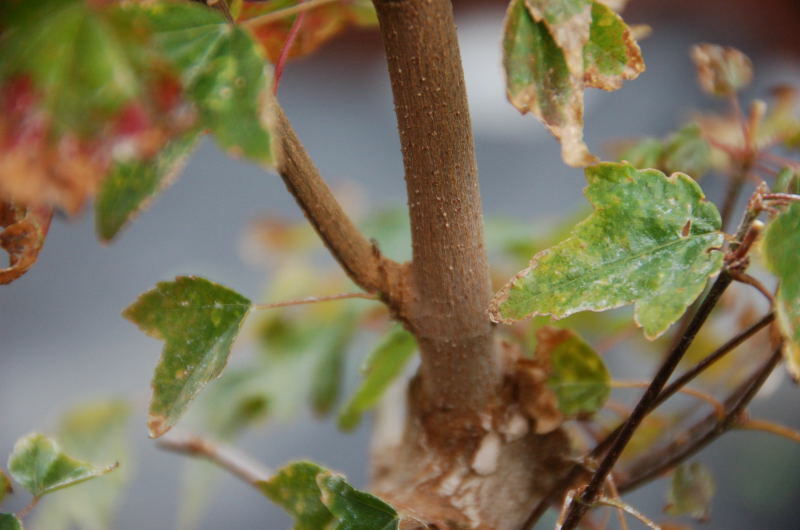 See if that helps your mottled leaves. I do not get that here, but have used it on other plants and it makes the leaves deep green. Magnesium deficency….. I would like to see some of your work with field grown trees. I will be planting some in the ground to take advantage of the faster growth, but in a managed approach such as that you take. That’s a great insight into this frustrating group of issues we both face with our favored maples. I have had a better run this season with success in getting a few of the trees burnt edge and blemish free. It has taken daily vigilance and numerous treatments to get this result, but I think I may be onto something. Rather than go into it here Al, I will start a dedicated page to it on my blog and now that I’m seeing very promising results, it will make it a worthwhile exercise. 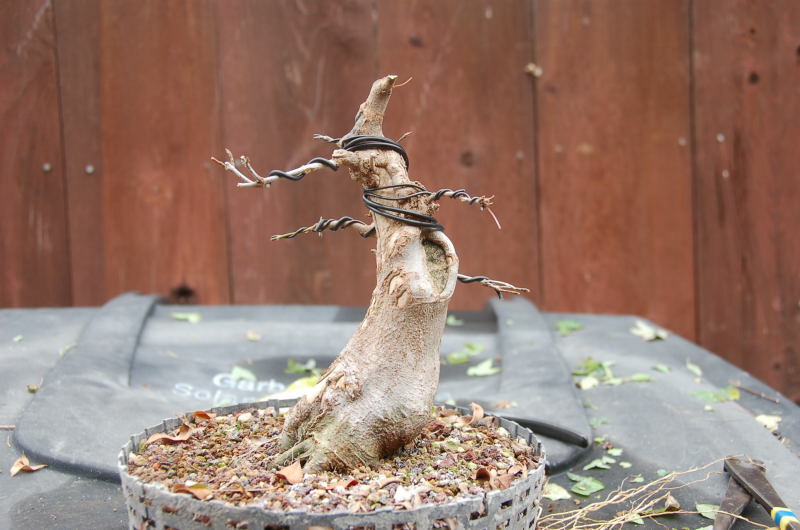 I have only just started writing this blog of mine, and will be adding more pics and info on my ground grown trees to my Trident Maple pages in weeks to come, so stay in touch. With the swapping of info like this we may just get somewhere with these problems. btw… we visited the Japanese Gardens in Fresno about 5 years ago after our journey to the Giant Redwoods…. it’s a beautiful city. Thanks Shane, We hold our yearly bonsai exhibit in that park each spring. Coming up in a couple months. You’ll have to take some photos of the exhibition Al…. what a beautiful venue for your exhibit. We were fortunate to visit there in the Fall, and it was ablaze with Autumn color. Just spectacular! One of the true highlights of our US visit. 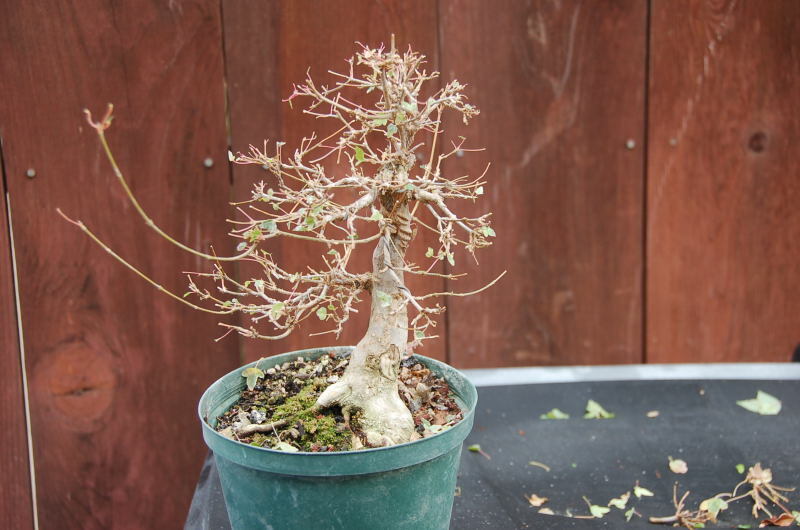 Hey guys, I have a Trident Maple Bonsai Tree newly brought as of July 2013 from Bonsai boy of New York. I’m not quite sure how old the tree is, if I were to guess I would say about or around 6 years of age. I have a few questions and hope you will able to help me with some of your experience. I live in St.Louis MO. It’s currently winter time, but St. Louis isn’t a really cold winter place. The average low in height of winter is 24*F, then the temp slowly starts to rise back again throughout the rest of January until the height of summer where the average day time high is 89*F in July. Currently I have the tree outside sitting on the patio table in back yard and we just got 8 inches of snow, so the tree is snow covered. Now when the tree came it was in a 8 by 6 inch pot. 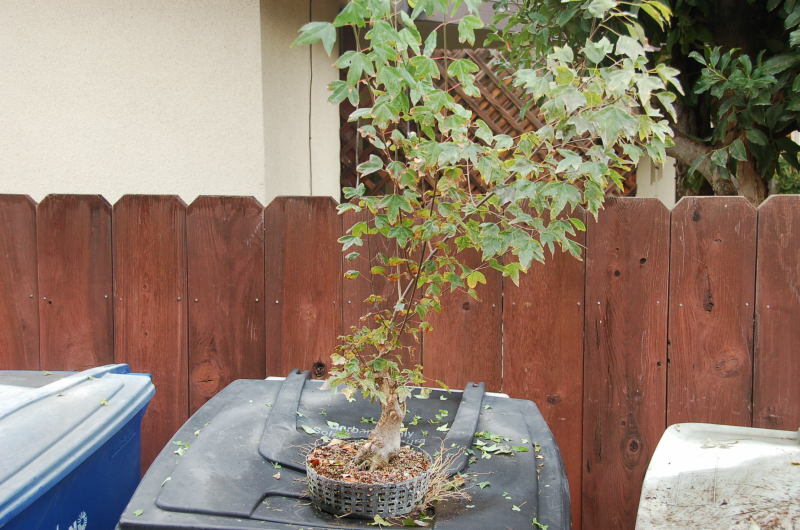 I planted it the tree in a 14 inch pot that is 4 inches deep. Even with the cold it took a while, but as of Wednesday the soil was frozen. Should I leave the tree outside or put it in the garage for the rest of winter? 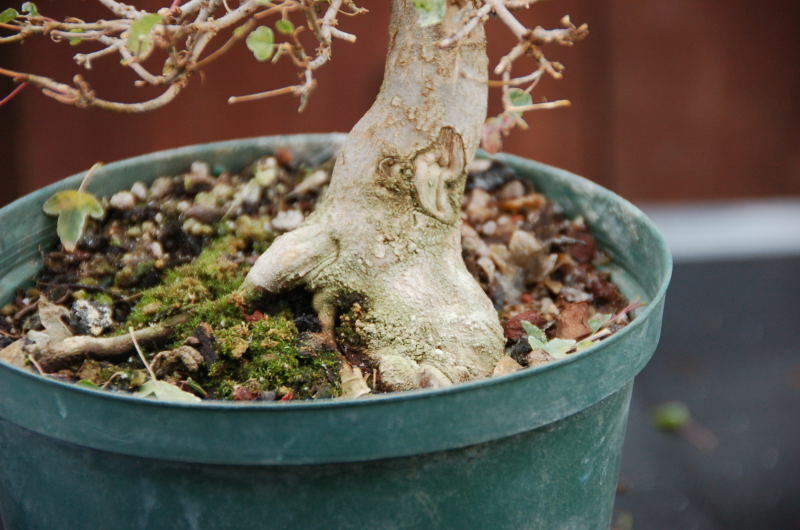 I notice whenever it is outside the limbs are more flexible, but in the garage the limbs are more prone to cracking and splitting and they aren’t as flexible. 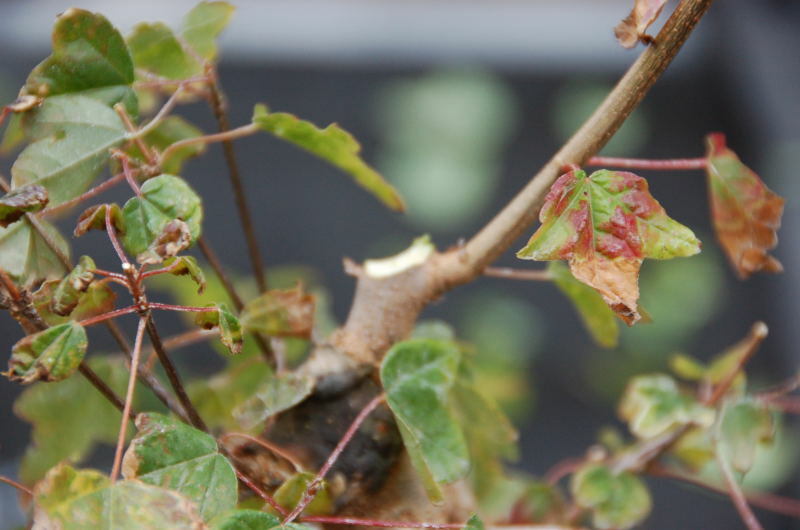 Also with summer care, unfortunately, when I got the tree in July some of the leaves were sun scorched, but the tree didn’t die, it even put out new growth, but only around four leaves in total before the cold hit in October ending the growing season. For summer care it’s morning sun and evening shade right? Thanks guys. Please get back to me and let me know what I should do. Merry Christmas by the way, and happy new year. I do not have much experience with trees from your area and how they behave in winter. 24 degrees for extended periods of time would probably wreck havoc on a trident. It gets that cold here occasionally but for just a few hours in the morning. Extended periods of over 6 hours could split trunks. I would ask around in your area at clubs or join a discussion forum where you can get input from people in your area or experience over wintering tridents in the cold.